Cable set top boxes are a distraction. The FCC is regulating apps. For decades Congress has gradually deregulated communications and media. This poses a significant threat to the FCC’s jurisdiction because it is the primary regulator of communications and media. The current FCC, exhibiting alarming mission creep, has started importing its legacy regulations to the online world, like Title II common carrier regulations for Internet providers. The FCC’s recent proposal to “open up” TV set top boxes is consistent with the FCC’s reinvention as the US Internet regulator, and now the White House has supported that push. The FCC Targets Cable Set-Top Boxes—Why Now? With great fanfare, FCC Chairman Thomas Wheeler is calling for sweeping changes to the way cable TV set-top boxes work. In an essay published Jan. 27 by Re/Code, Wheeler began by citing the high prices consumers pay for set-top box rentals, and bemoans the fact that alternatives are not easily available. Yet for all the talk and tweets about pricing and consumer lock-in, Wheeler did not propose an inquiry into set-top box profit margins, nor whether the supply chain is unduly controlled by the cable companies. Neither did Wheeler propose an investigation into the complaints consumers have made about cable companies’ hassles around CableCards, which under FCC mandate cable companies must provide to customers who buy their own set-top boxes. To receive streaming Internet video, it is necessary to have a smart TV, or to watch it on a tablet or laptop computer that, similarly, do not have access to the channels and content that pay-TV subscribers pay for. The result is multiple devices and controllers, constrained program choice and higher costs. This statement seems intentionally misleading. Roku, Apple TV and Amazon Fire sell boxes that connect to TVs and allow a huge amount of streaming content to play. True, the devices are still independent of the set-top cable box but there is no evidence that this lack of integration is a competitive barrier. Last Friday I attended a fascinating conference hosted by the Duke Law School’s Center for Innovation Policy about television regulation and competition. It’s remarkable how quickly television competition has changed and how online video providers are putting pressure on old business models. I’ve been working on a project about competition in technology, communications, and media and one chart that stands out is one that shows increasing competition in pay television, below. Namely, that cable providers have lost nearly 15 million subscribers since 2002. Cable was essentially the only game in town in 1990 for pay television (about 100% market share). 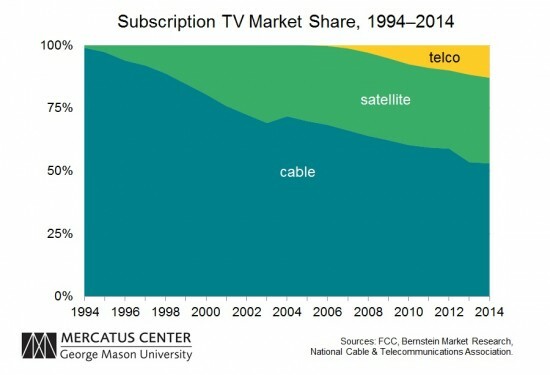 Yet today, cable’s market share approaches 50%. This competitive pressure accounts for some cable companies trying to merge in recent years. Much of this churn by subscribers was to satellite providers but it’s the “telephone” companies providing TV that’s really had a competitive impact in recent years. Telcos went from about 0% market share in 2005 to 13% in 2014. This new competition can be tied to Congress finally allowing telephone companies to provide TV in 1996. However, these new services didn’t really get started until a decade ago when 1) digital and IP technology improved, and 2) the FCC made it clear by deregulating DSL ISPs that telephone companies could expect a market return for investing in fiber broadband nationwide. And below is market share data going back ten more years to 1994 using FCC data, which uses a slightly different measurement methodology (hence the kink around 2003-2004). 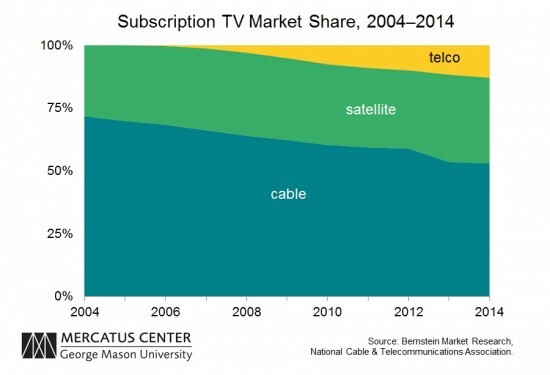 I’ve also omitted market share of Home Satellite Dish (those large dishes you sometimes see in rural areas). Though HSD has negligible market share today, it had a few million subscribers in the mid-1990s. I may add HSD later. What market failure? The weak transaction cost argument for TV compulsory licenses. Television is competitive. Congress should end mass media industrial policy. Congress is considering reforming television laws and solicited comment from the public last month. On Friday, I submitted a letter encouraging the reform effort. I attached the paper Adam and I wrote last year about the current state of video regulations and the need for eliminating the complex rules for television providers. 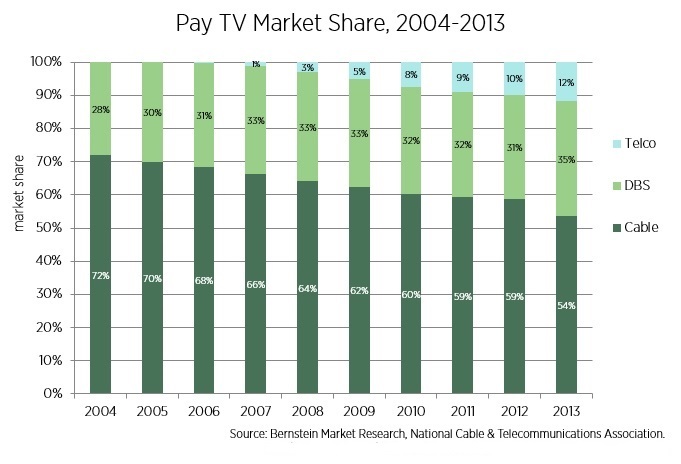 As I say in the letter, excerpted below, pay TV (cable, satellite, and telco-provided) is quite competitive, as this chart of pay TV market share illustrates. In addition to pay TV there is broadcast, Netflix, Sling, and other providers. Consumers have many choices and the old industrial policy for mass media encourages rent-seeking and prevents markets from evolving. There’s a small but influential number of tech reporters and scholars who seem to delight in making the US sound like a broadband and technology backwater. A new Mercatus working paper by Roslyn Layton, a PhD fellow at a research center at Aalborg University, and Michael Horney a researcher at the Free State Foundation, counter that narrative and highlight data from several studies that show the US is at or near the top in important broadband categories. For example, per Pew and ITU data, the vast majority of Americans use the Internet and the US is second in the world in data consumption per capita, trailing only South Korea. Pew reveals that for those who are not online the leading reasons are lack of usability and the Internet’s perceived lack of benefits. High cost, notably, is not the primary reason for infrequent use. I’ve noted before some of the methodological problems in studies claiming the US has unusually high broadband prices. In what I consider their biggest contribution to the literature, Layton and Horney highlight another broadband cost frequently omitted in international comparisons: the mandatory media license fees many nations impose on broadband and television subscribers. These fees can add as much as $44 to the monthly cost of broadband. When these fees are included in comparisons, American prices are frequently an even better value. In two-thirds of European countries and half of Asian countries, households pay a media license fee on top of the subscription fees to use devices such as connected computers and TVs. …When calculating the real cost of international broadband prices, one needs to take into account media license fees, taxation, and subsidies. …[T]hese inputs can materially affect the cost of broadband, especially in countries where broadband is subject to value-added taxes as high as 27 percent, not to mention media license fees of hundreds of dollars per year. US broadband providers, the authors point out, have priced broadband relatively efficiently for heterogenous uses–there are low-cost, low-bandwidth connections available as well as more expensive, higher-quality connections for intensive users. Further, the US is well-positioned for future broadband use. Unlike many wealthy countries, Americans typically have access, at least, to broadband from telephone companies (like AT&T DSL or UVerse) as well as from a local cable provider. Competition between ISPs has meant steady investment in network upgrades, despite the 2008 global recession. The story is very different in much of Europe, where broadband investment, as a percentage of the global total, has fallen noticeably in recent years. US wireless broadband is also a bright spot: 97% of Americans can subscribe to 4G LTE while only 26% in the EU have access (which partially explains, by the way, why Europeans often pay less for mobile subscriptions–they’re using an inferior product). There’s a lot to praise in the study and it’s necessary reading for anyone looking to understand how US broadband policy compares to other nations’. The fashionable arguments that the US is at risk of falling behind technologically were never convincing–the US is THE place to be if you’re a tech company or startup, for one–but Layton and Horney show the vulnerability of that narrative with data and rigor. Is STELA the Vehicle for Video Reform?